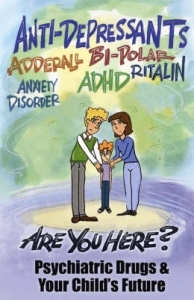 This very easy to read 16-page booklet simply asks parents to become aware of their options: question the information given them that their child has a “chemical imbalance” in the brain requiring a drug that could cause hallucinations, psychosis, suicide and death. Psychiatric Drugs & Your Child’s Future doesn’t dictate what parents must do; it just tells them to use their best parental judgment. However, in order to do this, they need to be informed.